Banyan Tree Al Wadi Hotel Ras Al Khaimah - Ras Al Khaimah Discount Hotels, Resorts & Apartments!! Banyan Tree Al Wadi Hotel Ras Al Khaimah - Ras Al Khaimah Hotels, Resorts & Aparments United Arab Emirates with Special Discounted on Published Rates!! Overview: Ras Al Khaimah, UAE - Amid stretches of desert sand in tranquil Wadi Khadeja, the protected enclave of the evergreen ghaf tree, lies the new exclusive resort of Banyan Tree Al Wadi. Banyan Tree Al Wadi is the first desert resort in the United Arab Emirates to offer an all-pool villa concept, complete with 3,000 sqm of Asian-inspired hydrotherapy spa facilities, a dedicated nature reserve, a private beach club and an 18-hole championship golf course. This oasis of indulgence spans over 100 hectares, of which 60 hectares are dedicated as a nature reserve – home to local desert wildlife such as Arabian gazelles, camels and oryxes, offering guests a unique opportunity to interact with and observe these gentle creatures up close. The resort is a 45 - 60 minutes drive from Dubai International Airport and a 20-minute drive from the vibrant Ras Al Khaimah city centre. With awe-inspiring views of desert greenery, tinged with the terracotta hues of scorched desert sand, the 158 sqm Al Rimal Deluxe Pool Villa depicts the traditional mud brick architecture of Ras Al Khaimah. Arabesque-inspired doors open into a wide passageway leading to the walk-in wardrobe, whilst the soaring high-ceiling adds grandeur to the wood motif touches that can be found throughout the villa. The perfect venue to indulge in the quietude of desert surroundings, the villa features a picturesque garden, private sundeck and pool. Designed to emulate the nomadic tent style of Bedouin tribes, the 253sqm Al Khaimah Tented Pool Villa is the elemental inner sanctum for world-weary nomads. Set amidst the vast realms of the Arabian desert, day-beds and sun lounges complete this oasis of serenity, where one can seek reprieve from the desert sun by dipping into the inviting waters of the private pool. 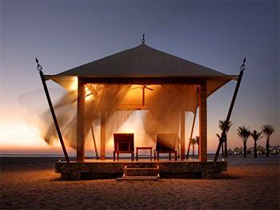 Resting dunes-apart, the Al Sahari Tented Pool Villa offers a romantic hideaway and a heightened sense of being. Flowing canopied ceilings create an intimate space where modern luxuries merge seamlessly alongside Arabic artwork and antiques. Designed to promote escapism, indulge in a selection of pampering spa treatments in the villa’s dedicated spa treatment room or unwind in the pool overlooking undulating desert sand.